Scanning through different portable planers, PORTER-CABLE PC60THP 6-Amp Hand Planer stood out for me because aside from its great and affordable price, its performance is unparalleled, easy to work with and allowed me to complete my projects in time and with an outstanding and smooth finish. Its 6-amp motor power gave me the versatility and efficiency I needed for my project. Plus it is lightweight which makes it even advantageous for me. This review will give you all these details about this power tool and why it worked for me, at the same time, help you decide what portable planer to buy that will suit your needs. I needed a planer because I was fixing our old kitchen cabinet door at home. I am not thinking of replacing it anytime soon because it is still repairable and there is still a considerably good quantity of usable wood in it. Since getting into woodworking, I made it my job to check and repair whatever wood furniture we have that needs fixing, because it is more economical than buying a new one, aside from wasting a good amount of wood. I have used other hand planers before and they are no way in parallel to the performance and quality of this PORTER-CABLE PC60THP 6-Amp Hand Planer. I am very happy with it and only wished I have known about this planer even before. This planer is perfect for home use because it gives just the right enough power to allow us to do any kind of woodwork in any materials. Though heavy duty in power, it is however lightweight weighing only 8.8 pounds thus it is easy and convenient to use in a non-professional setting who like me, doesn’t have the manual power to hold and plane for a very long time. However, because of its added features and capabilities, it can at the same time keep up with the demands of a professional setting, thus this also fits in the mark for a professional use. Each one of us has our own specific criteria and expectations when looking for a good planer. But generally, there are certain components that should be present and be considered regardless. These are the main points that you have to look into when choosing for your planer. This is one factor to know if a planer is good enough to do the job you require. It determines the quality of performance and its capacity to do various tasks and work even with heavy-duty materials. The higher the motor power and speed means that planer is more capable to do bigger projects. Another factor to check if the planer has a good performance and is efficient is the quality of the cut and planing. Planer should be able to have the features that will allow it to make various sizes of cut for different purposes and applications. The quality of the cut also depends on the quality of the blade used. Some planers have dual-blade capacity thus allows them more versatility and flexibility in their performance and outputs. Best planers have an array of different added features to make it more functional and efficient. Consider checking its other components as well. A dust bag can be a very helpful tool when planing as it is one way where you could save a lot of time and effort. Kickstand and easy blade installation helps increase safety of use. It’s these little details that can sometimes make a huge difference and can be a deciding factor as well. 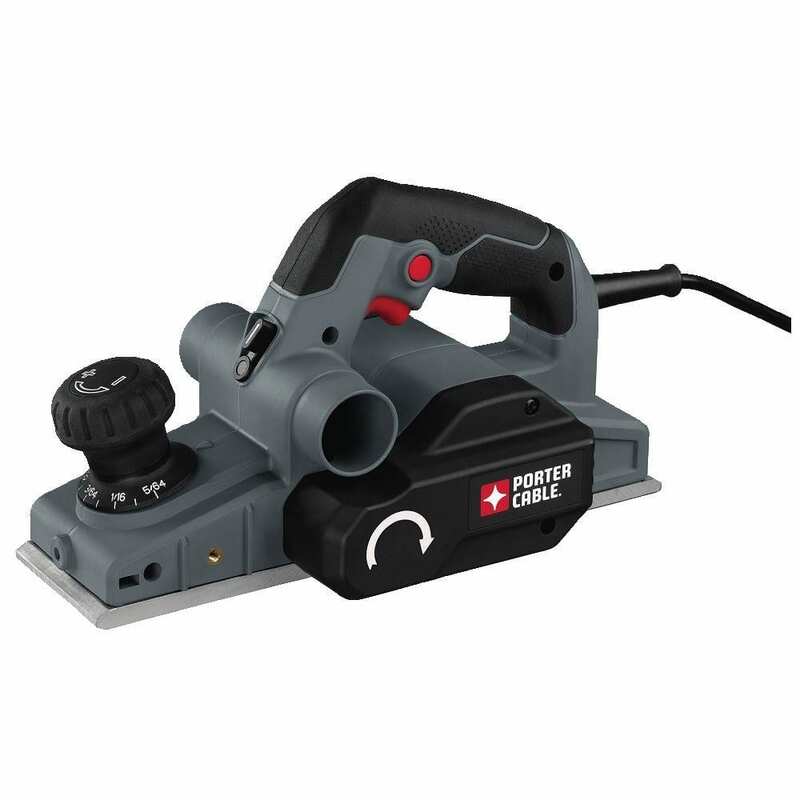 Built for power and comfort, PORTER-CABLE PC60THP 6-Amp Hand Planer will give you an effective and efficient performance and output with its 6-amp motor power and max speed of 16,500 RPM for a smoother operation and finish. Despite this, it is thoughtfully made to be lightweight so it will be convenient and easy to use, thereby increasing productivity. Along with all of these, it has other added feature to also assure you convenience and ease of use. This planer has a 6-amp motor power and max speed of 16,500 RPM thus allows it to cut hard materials smoothly. With this amount of power, it can have a wider scope of material and tasks to work on. The higher the power and speed, of course the faster and more capable it is for heavy duty jobs. It is designed with a dual-side dust extraction that gives you the flexibility and the option in which side to attach the dust bag to keep and maintain your work area clean. Like most planer, this also comes with a kickstand that elevates the blade for its safety and so is for the work area. It is built with a lock-on switch as well that lets you run the planer without having to press the two-finger trigger the whole time. The depth knob is made with an easy-grip surface for easier and more convenient handling. It comes with an over mold depth knob that provide 10,000 positive steps for control and multiple depth settings. It has an 11.5” cast aluminum shoe that provides control and precise results. It allows you up to 5/64” depth of cut, hence with that, it can make varying sizes of cuts, and whichever you would prefer and need. To know how this planer is at par with how it was advertised, I researched and read through the different reviews of those who have actually bought it and compiled all the information to give you an actual and unbiased comments and feedbacks. One consideration in knowing that a planer is good is if it works very well. All customers swore that this planer does exactly what it supposed to do and more. It has a smooth finish, easy to operate and saves a lot of time using it. It comes with wonderful added feature that makes it even more functional. A lot of people likes that it has a dust bag as it could get messy when working with it. They wished however that it could have been bigger as it fills up rather quickly. One customer mentioned about the kickstand to be made in a little less quality of material as compared to the other parts. Other than that, they are happy having this product and even glad that they were able to purchase it a very affordable price. We understand that there are still other options available for you when you check the market for a good planer, thus we have also included a list of these five other planers and a brief description of each that you might want to consider. Bosch PL1632 is a powerful planer with a 6.5 amp and 16,500 RPM speed for a quality and smoother finish both in soft and hard woods. It is built with a dual-mount guide fence with protective shield for a stable planing and a separate inch and metric depth scales for easy setting of depth. A spring-loaded stand elevates tool is available to protect the blade and a lock-off/on button to avoid accidents in start-up and for prolonged operation. This kit aside from the planer includes a reversible wood razor blade, dual-mount guide fence, no mar plastic overshoe for fence, shavings bag and blade wrench. Equipped with double-edge carbide blades, this planer is powered by a 6.5-amp motor and speed of 17,000 RPM to give its users efficient performance and a smoother finish. It is designed with precision machined aluminum base for a more accurate planing and an aluminum and balanced planer drum to reduce vibration when used. Other features include easy blade installation, ergonomically rubberized front and rear handles for comfort, lock-on button, an easy to read scale and high quality poly-v belt for durability. A highly durable and easy to use planer, it has a 7.0 amp motor that assures you effective results when used even on the hardest woods. It allows you to use large high speed steel blades for straight edges and reversible carbide blades for a more detailed and precise woodwork. It also comes with a calibrated depth adjustment knob for precise depth setting and a precision machined shoe bottom and side for a smoother finish and accurate square rabbet joints. This planer from Bosch includes 2-blade system, chip ejection switch and ratcheting depth knob. It is powerful enough to give you a high performance and increase your efficiency with its 6.5-amp motor and 16,500 RPM that powers a versatile two-blade wood razor system. It comes with a protective shield to cover the part that is not in use. Its other features include easy to adjust bevels, durable micro grain carbide blades, spring-loaded park rest that protects the blade and easy start-up. Kit includes planner, bevel guide fence, blade wrench, chip bag and case. Built to be lightweight weighing only 6 pounds, this portable planer is perfect for fixing stubborn doors and fitting wood. With a 34,000 cuts per minute, it makes sure that your work will have a smooth finish taking away all rough areas. Its base plate shoe is designed with a v-shaped groove for flattening sharp corners easily. Other feature includes the parallel fence that guarantees parallel stroke to the edge of the wood resulting to a more accurate and straight cuts. Its package aside from the planer comes with a dust bag, kickstand, and a parallel fence bracket. And finally at this part we hope we were able to fill you in and provide you with the information and details you need to know and perhaps able to answer all your questions about this planer. It is certainly very tricky to find the best one out there but me, you will be getting a very good deal with this planer. Performance wise, PORTER-CABLE PC60THP 6-Amp Hand Planer has a powerful motor, great speed, and precision. It is easy to use and it can surely give you the smooth finish to any project or woodwork that you are working on. And it is not as expensive as other planers, but still getting the same caliber of productivity and efficiency.